Why care about brand? As a leader your job is to delight the customer in a hard-to-copy, margin-enhancing way. While “delighting” customers doesn’t need explanation, and in fact Product Management is well versed in this dictum, the rest of this equation is worthy of a deeper dive. First on the docket was “Hard to Copy.” For this discussion, Gibson dove deeply into his experience at Netflix. There are many attributes that are difficult to copy, and crafty leaders are experts in taking advantage of this. Such factors include network effects, unique technology, economies of scale (Gibson did mention that Netflix has a huge advantage here, citing that the cost for Netflix to stream an hour of video is $0.02, whereas Hulu’s cost for the same hour of video is $0.20, a 10X advantage), switching costs (are there barriers to switching? ), and of course the concept of brand. This advice is rubbish, but not for the obvious reason. A brand is a living entity and it needs to be tended to thrive. And most importantly, if you assume that just having “awesome” products will be enough to pull the brand through, you are mistaken. A better definition, one that Gibson enunciated, is that a brand is the story that builds a trusted relationship with customers. If you think of some iconic brands, such as Starbucks, BMW, and Apple, you can begin to see the brand being bigger than the products of the companies. The Positioning model of the brand, getting people to notice the brand, is an art, but there are some guidelines. If we met the “brand” at a party, how would it describe itself? A solid analysis, and it does ring true, as indicated by the audience reaction (this was preceded by an impromptu group exercise, and was surprisingly close to what the board settled on). 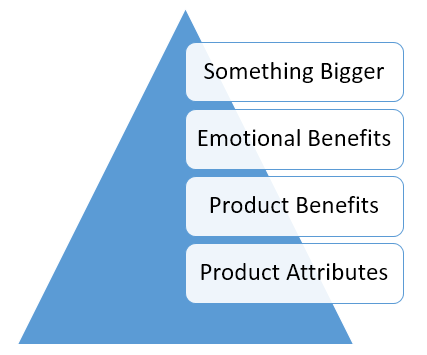 The other model that Gibson discussed was the concept of a “Brand Pyramid” where you build the brand from a foundation into a greater entity. To build this pyramid, you work the way the Egyptians did in constructing the Pyramid of Cheops, you start at the bottom, and build up. An example that would be familiar to many if not all of the Product Management universe is Apple. The session was lively and interactive. Gibson was engaging and livened up the atmosphere with solid marketing knowledge around the importance of brand and how important it is to building a successful business. His tales of the inner workings of Netflix were quite entertaining, from their inception as an online Blockbuster Video, to their realization that selling DVD’s was a battle that they would lose to Amazon, refocusing on the red envelope, the constant need to test hypotheses, and how important it was to building Netflix into the force that it is in streaming video (or their desire to be best associated with “Entertainment”.) Netflix’s key differentiator has become the increasingly important “Netflix Original” programming, building upon their foundation purveyor of media, and adding media creation to their consumption based model. Since Gibson finished with ample time for questions, he spent some time on Netflix’s mistakes (Quickster, anyone? ), and how the CEO, Reed Hastings built and fostered a culture of risk taking, and being open to acknowledging failures, regardless of how catastrophic they were. Geoff Anderson – a practicing product manager with over 20 years of experience, in a variety of industries from semiconductor manufacturing equipment, networking technology, industrial measurement and test, enterprise communications software, nanotechnology, and educational services. He has a degree in Physics from SJSU, volunteers in the rescue of retired racing greyhounds, mentors high school kids interested in science and physics, and loves to read science fiction novels.